Indonesia’s president Joko Widodo has announced large investments in welfare and infrastructure in West Papua, a region that over the last decades suffered continuous repression and disregard by the government in Jakarta. Widodo gained a majority of Papuans’ votes in the 2014 presidential elections, as many believed he would bring change and promote dialogue. Those hopes are now withering. Activists worry Widodo thinks he can solve past and present wounds with development alone, and without acknowledging and addressing human rights abuses that have occurred and still occurr. Furthermore, Jakarta recently responded dismissively to accusations of such abuses tabled by Pacific island nations at the UN. 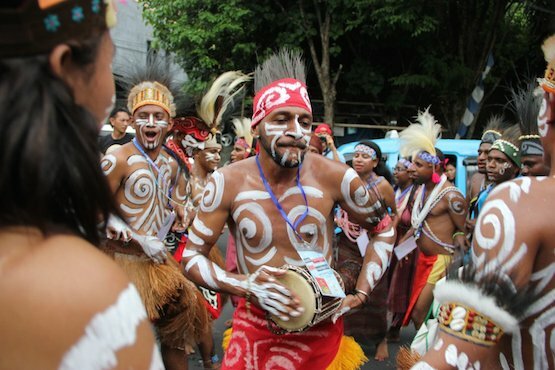 Indonesian President Joko Widodo’s development of Papua needs more emphasis on human rights, according to activists. Father Neles Tebay, a Papuan activist priest said that in the two years since Widodo took office he has not brought any significant improvement in human rights. "The president presented a new paradigm in dealing with Papua by using welfare and various infrastructure projects, such as the construction of rail, bridges and highways that cost trillions of rupiah," he said. "But infrastructure development cannot run concurrently with murder, kidnapping and the suppression of civil society," the priest said during a discussion at the Setara Institute for Justice and Peace in Jakarta on Oct. 13. He was referring to a report by the Setara Institute documenting such violations. This year, according to the report, 2,293 Papuans were arrested, 61 shot and 13 killed by the army, police and the military wing of the Free Papua Movement. The priest also pointed out that the international community has drawn attention to the Papua issue. At the U.N. General Assembly meeting in New York in September, the leaders of six countries in the Pacific region, such as Solomon Islands, Vanuatu, Nauru, the Marshall Islands, Tuvalum and Tonga raised the issue. "The countries’ attention indicates that the world is still questioning Indonesia’s commitment to resolve the Papua conflict," he said. He demanded that Widodo hold a dialogue with the Papuan people to find a solution because the government has so far not listened to them. Father Antonius Benny Susetyo, Setara Institute’s council secretary said Widodo is at a turning point. Widodo likes dialogue but his chances at resolving the conflict "depend on his political commitment," he said. Bonar Tigor Naipospos, deputy chairman of the Setara Institute said Papuans trust Widodo and he won 70 percent of their votes during the last presidential election "because they had high hopes that he would bring change." However, he made no significant progress and even Papuan resistance to the government has increased, according to Naipospos. "Widodo’s failure lies in his idea that development will solve everything but it is not just about poverty. The most important thing is to seize the hearts and minds of Papuans and make them feel part of Indonesia," he said. Cypri Jehan Paju Dale, a researcher who has published several books on Papua, said that the increased international attention is an important test for Indonesia. "It is clear that a militaristic approach would worsen the situation," he said. Indonesia’s denial of the human rights issues in Papua at the U.N. General Assembly does not help anyone and does not fix the real situation in Papua, he said. "There is no other rational and ethical choice for Indonesia, as well as development they must take responsibility for what has happened in Papua," Dale said. At the U.N. General Assembly meeting, Nara Masista Rakhmatia, an official at Indonesia's permanent mission to the United Nations, said that the Pacific countries’ statements were designed to support separatist groups. She reiterated Jakarta's stand that it has mechanisms in place to deal with human rights abuses in Papua. "With such a vibrant national democracy, coupled with the highest commitment to the promotion and protection of human rights at all levels, it would be nearly impossible for any human rights allegations to go unnoticed and unscrutinized," she said. Papua consists of two provinces — Papua and West Papua — and has a population of nearly four million, according to government statistics. The majority are Protestants — 52 percent — and Catholics count for 15 percent.